I remember reading E. L. Doctorow’s, Welcome to Hard Times, years ago while I was stranded (along with a rock band) in the middle of Alabama. Our tour bus had broken down in a dusty rural town. As we waited for the auto mechanic’s father (a kindly old gentleman) to drive us to the airport, I parked myself in front of the snack shop to read my book. I read about the desperate townspeople of Hard Times (a tragic fictional place that was near impossible to escape) and was filled with great anxiety. Was fiction becoming reality? Would I forever be stuck at an Alabama snack shop? As I continued to read Welcome to Hard Times, it crossed my mind that the bitter town of Hard Times was perhaps the worst place in which one could ever imagine to live. Sanditon is one of Jane Austen’s widely read unfinished works. She wrote the story, while ill, during the last few months of her life, starting in January of 1817. She died in July of the same year suffering from what many believe to have been Addison’s disease. In Sanditon, the heroine, sweet Charlotte Heywood receives a well-intentioned invitation from Mr. Parker to visit the beaches of Sanditon; an area that Mr. Parker is rather obsessed with and a place in which he has obviously invested most of his money. Charlotte soon finds herself spending her days amongst a whole bunch of sick people, not to mention a few hypochondriacs and the very proud, Lady Denham, Mistress of Sanditon House. This Lady Denham character is downright creepy as she pushes “asses’ milk” on invalid-newcomers. I expected her to expose some fangs or sharpened fingernails in a sort of Dracula-like fashion, but then reminded myself that this is Jane Austen. Pure Austen, without the implanted zombie, mummy, or unmentionable that I also delight in. But is this not the perfect setting for a mash-up? How well this one would work! Those nasty Sanditon winds — surrounded by sickness — with the menacing presence of Sanditon House towering over the little village makes for a perfect dark Jane Austen setting. 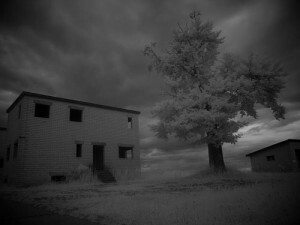 *Photo: Wollseifen Ghost Town Achen Germany by SebastianDooris, obtained through Flickr.